We have been told by mainstream press (citing anonymous intelligence officials) that Guccifer 2.0 was a GRU officer. We have also seen this asserted in an indictment that emerged in July 2018. However, there are many reasons why this attribution remains doubtful, and, unlike the attribution, these reasons are based on verifiable evidence that is already in the public domain. In order to even begin to understand who Guccifer 2.0 could have been, it was imperative to first understand WHAT Guccifer 2.0 was. This site links to evidence and discoveries made during the past two years that help to explain what Guccifer 2.0 was. Much of the evidence has been disregarded by the mainstream press and is routinely omitted in their reportage despite the volume of evidence and how comprehensive and detailed some of the analysis has been (especially with regard to studies published by third parties). (2) Guccifer2.0 Timeline - What Happened & When Did It Happen? 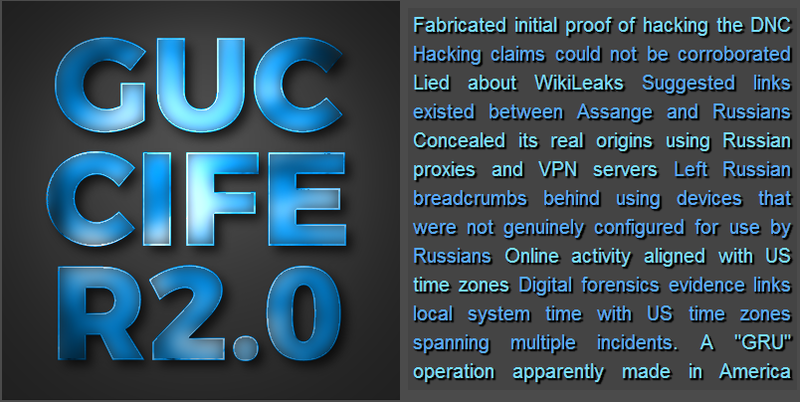 Before looking at intent, motive, conflicting evidence and more, it's important to become aware of a few key facts about Guccifer2.0 and some of the claims he made. Guccifer2.0 stated in an interview with Lorenzo Franceschi-Bicchierai (for Motherboard / Vice News) on the 21st of June, that he breached the server using a "0-day exploit of NGP-Van". ThreatConnect, although still apparently unswayed from their assessment that Guccifer2.0 is a collective of Russians (we'll get on to that topic later in the article) - did report some very useful facts that serve to debunk Guccifer2.0's claims. a) NGP-Van is a cloud-hosted web-service separate from the DNC network, the claimed method of breach was discredted by ThreatConnect. - It was noted that phishing for credentials would be far more practical for exploiting such a service. b) He makes claims of lateral movement within the DNC network - but doesn't realize that his effort to match the reporting of Crowdstrike falls down due to his own misinterpretation of that. - CrowdStrike's report mentions lateral movement in terms of the "BEAR" infrastructure across the whole of the Internet rather than movement within the DNC network - it looks like Guccifer2.0 s trying to make claims that correlate with what he has inferred from CrowdStrike's reportage. c) To quote ThreatConnect at the time (and nothing has been reported to contradict it since): "As it stands now, none of the Guccifer 2.0 breach details can be independently verified". Guccifer2.0 put considerable effort into trying to convince people he was the source for the DNC email leaks that ended up in the public domain on July 22nd. He outright claimed it, multiple times. He made a point of mentioning Wikileaks in his purposeful destruction of his own reputation on October the 4th (a reference to his Clinton Foundation claims and the files he posted supposedly demonstrating the hack) and on October 18th showed he was trying to push a perception of being associated with Wikileaks and responded to a Wikileaks tweet as though it was intended for him personally (when it wasn't). Going back to the 4th, the supposed "Clinton Foundation Hack" - is also where his claim starts to show cracks. He stated "I can’t post all databases here for they’re too large. I’m looking for a better way to release them now.". Why, if he was really the source for the DNC emails, would he be at all struggling to find a solution to get the data published? - Why express this 73 days after the last large batch of data he claims to have acquired was successfully published through Wikileaks? Even putting seemingly contradictory statements aside - Assange has implied that the emails were leaked, rather than hacked, in contradiction with Guccifer2.0's claims and there is still nothing independently verifying Guccifer2.0's claims. On October 4th, 2016 - Guccifer2.0 claimed to have hacked the Clinton Foundation. He followed this up by posting an archive containing files that were all from previous leaks and from documents in the public domain. Ultimately, he has never produced anything that actually shows such a hack had taken place. These are not all of his lies or unverified claims, far from it, but they are the ones that are critical to know so that the rest of this article makes sense to you. Above all, the first is most important - his claims to breach the DNC turned out to be fantasy. There is a difference between independently verifiable evidence and the activity somebody claims to have engaged in or that can be fabricated in an effort to misdirect and masquerade as someone they're not. - None of Guccifer2.0's claims of hacking were independently verifiable and several were debunked by ThreatConnect. - There is nothing demonstrating Guccifer2.0 was really a hacker. He CHOSE to name his computer account after the founder of the Soviet Secret Police. He CHOSE to create/open and then save documents so the Russian name was written to metadata. 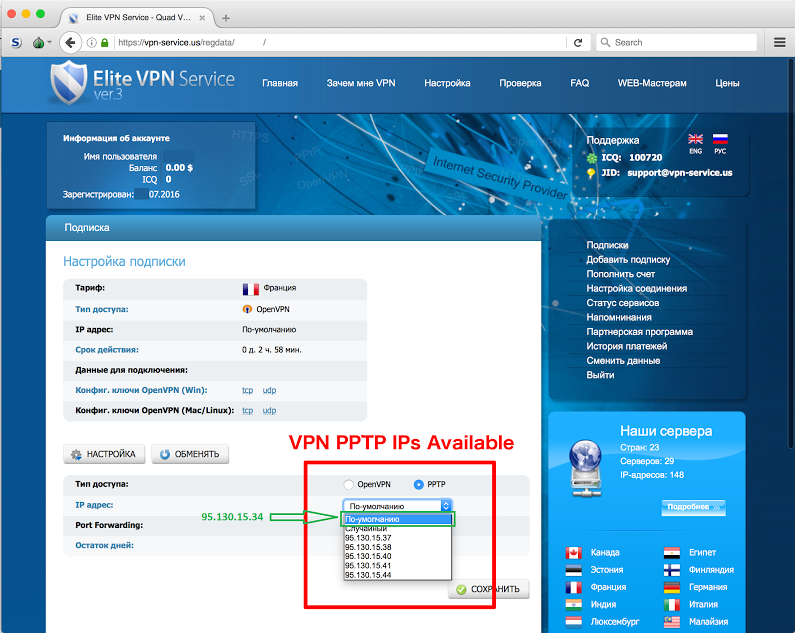 He CHOSE to use a Russian VPN service to cloak his IP address. He CHOSE to use public web-based email services that would forward his cloaked IP. He CHOSE to use the above to contact various media outlets on the same day. Note: Thanks to a 3rd party's further investigation, it now appears he may have used a single document as a Russian template (with Russian stylesheet data in), saved it as a set of blank 'pre-tainted' files and then opened them later under a different username - copying/pasting in content from original documents into each blank 'pre-tainted' document before saving again - as the specific process for creating documents (Stylesheet change RSIDs correlating across files certainly suggest it and the metadata fully corroborates it too). With regards to providing WikiLeaks with anything, it appears (according to Mueller's indictment) that this didn't occur until July (long after WikiLeaks had announced possession of leaks) and it's not even clear what files Guccifer 2.0 had sent them (or whether they actually published anything he had sent). Pretty much everything stated about him has been based on assumptions, acceptance of questionable admissions and the public have been given little more than conjecture based on factors he seems to have been controlling and choosing. Sam Biddle of The Intercept (one of the first people to write about Guccifer2.0 when he emerged) details the problem, in a broader sense, of blaming Russia generally for the hacks in an article released on December 14th 2016, titled: "Here’s the Public Evidence Russia Hacked the DNC — It’s Not Enough". - It covers the fact that the evidence on Guccifer2.0 looks dodgy but doesn't try to determine the intent behind his efforts to deceive and claim credit for hacking the DNC (such as this article is attempting to make clear) and instead focuses on the broader scope of allegations about the DNC being hacked. So... it turns out that if ThreatConnect had tried using the default options - they would have been allocated the "exclusive" IP address that was NEVER really exclusive. 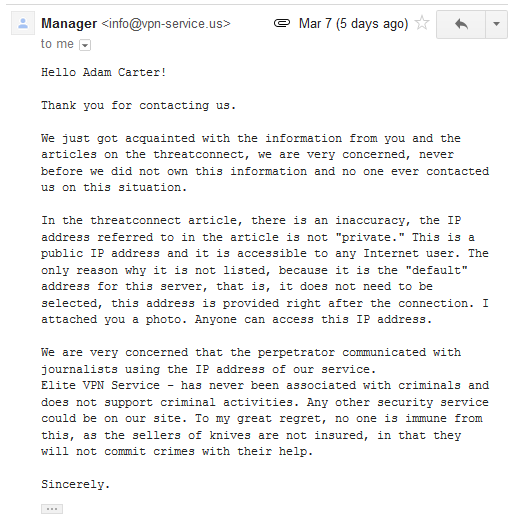 They've caused concern and distress unduly for a VPN Service provider by misrepresenting the service and produced false-positive indicators by suggesting the IP address was used by a shady group of Russians/Guccifer2.0 with exclusivity. Why didn't someone ask them sooner? In total, the amount of new controversies specifically exposed by Guccifer2.0's actions - was very little. The DCCC documents didn't reveal anything particularly damaging. It did include a list of fundraisers/bundlers but that wasn't likely to cause controversy (the fundraising totals, etc. are likely to end up on sites like OpenSecrets, etc within a year anyway). - It did however trigger 4chan to investigate and a correlation was found between the DNC's best performing bundlers and ambassadorships. - This revelation though, is to be credited to 4chan. - The leaked financial data wasn't, in itself, damaging - and some of the key data will be disclosed publicly in future anyway. All of his 'leaks' have been over-hyped non-controversies or were already in the public domain - the only exception being the apparent leaking of personal contact numbers and email addresses of 200 Democrats - and really that was more damaging to the reputation of Wikileaks than causing any real problems for Democrats. - Ultimately, it only really served to give the mainstream press the opportunity to announce that "leaked emails include personal details of 200 Democrats", again, seemingly an effort to undermine other leaks being released at the same time by legitimate leak publishers. There were multiple documents shared with TheSmokingGun, Gawker, ArsTechnica and others. 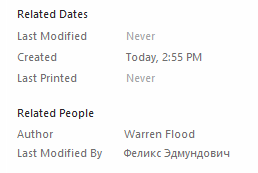 The first document, "1.doc" (mirror), was given considerable coverage, while the name "Warren Flood" was reported, the date in the report (rather than in the metadata) was reported and so it was attributed to Warren Flood on 12/19/15. Gawker incorrectly claimed the metadata showed the document was created in 2015 when it actually indicated the document was created by Warren Flood at a much later date. A more detailed look at the actual contents of documents (eg. RSIDs of different changes and correlations across files) gives further clues about the procedures used to intentionally stick "Russian fingerprints" on some of the files. Warren Flood was Biden's former IT director at the White House. A document that Flood authored in 2008 and that was attached to one of John Podesta's emails, was used by Guccifer 2.0 as a template into which he then copied the contents of the Trump Opposition Research, copied from this file (which is also attached to this leaked email).. It is Flood's document that the "CONFIDENTIAL" text in the background derives from. The copy of the Trump research Guccifer 2.0 had was actually a document originally authored by Lauren Dillon (DNC research director) and modified (and sent to John Podesta) by Tony Carrk (Research Director at Hillary for America). Several experts and their assessments have been cited, Motherboard (Vice) reference 3 such experts but only one appeared willing to be identified. - Carrying out our own analysis (and highlighting the process), we can see why the others may have chosen anonymity - their assessments seem to be limited and pick up on things that in aggregate, Guccifer rarely actually does. Guccifer2.0 used a "Russian smiley" (")))") ONCE! - This was in one of his first posts. The other thing that made him appear Russian was that he referred to hacks as "deals" a couple of times. - HOWEVER, he ONLY does this in the interview with Motherboard/Vice on the 21st of June - he never repeats this behavior in any other communications - so, it seems it was just put on for the purpose of the interview. - These are the main 2 things pointed out by the anonymous experts and are bizarrely both things he does only in 2 isolated incidents. Professor M.J. Connolly of the Slavic & Eastern European languages department at Boston University had the most valuable assessment - and could explain the syntactical traits that were missing from Guccifer2.0's writing. For our own non-expert analysis, details about differences between Russian/Slavonic Languages & English language can be found here, here and here. Compare this to the use of English language expected from someone who is really a Russian, as demonstrated in this screenshot of a video featured in an article by ThreatConnect on 2nd of September 2016. The difference is stark to say the least. It's clear from the above (as well as an analysis of a much larger corpus of Guccifer's words that I have compiled - see below) that he habitually uses definite articles, even when communicating in a live chat with Lorenzo Franceschi-Bicchierai of Vice's Motherboard, he rarely fails to include them. - The amount of instances where his definite and indefinite articles are correctly used (when they are used) is around 96%. - In other words, while he mangles English language selectively, he doesn't do it in a way that is consistent or in the way that is expected from those whose native language is one lacking definite and indefinite articles (such as is true with Russian language). He never claimed to hack through a server, or get under security or wait around being detected. His command of prepositions is very strong and he seldom drops the use of them. A separate and notable study carried out in 2018 by academics from University of Birmingham and Aston University looked at the corpus of Guccifer 2.0 and, in contrast to the above, actually found indications of Russian origin based on lexical errors and back-translations with the aid of Google Translate. Combining the findings, then, would seem to suggest that Guccifer 2.0 (or at least someone involved in the operation) was a Russian (though, a Russian that demonstrated a good grasp of English language syntax where Russians typically have difficulties). When you consider all of these various facts in aggregate and understand that Guccifer 2.0's claims to hack failed to stand up to scrutiny and were not verifiable, realize his actions only ever served to undermine leaks, ultimately caused no harm to the reputation of anyone except himself and WikiLeaks, needlessly and inexplicably gave the mainstream press fodder on which they could write headlines branding leaks as "fake", "discredited", "tainted by Russia", etc., had some non-hacking means of acquiring the DCCC documents and has had his claims of breaching the DNC network discredited by ThreatConnect... it becomes clear that Guccifer 2.0 is more complex than certain figures in the intelligence community would like us to believe. Anyone critically analysing the nature of Guccifer2.0 can see enough to identify whom he was serving to benefit through his activities online. - His lack of credibility and the inevitability of his Clinton Foundation server hack 'take' being exposed as nonsense makes it clear that Guccifer2.0 was a fraudulent construct intended to counter the leaks and try to take-down the credibility of Wikileaks as collaterol in the self-destruction of it's own reputation. Those with a motive mostly strongly correlating with this at the time would have been those that had potential leaks to worry about. Obviously with Podesta and other DNC staff being phished, the Clinton Campaign and DNC leadership will have had concerns over leaks and would likely have had a reason to seek mitigation. As of June 12th, these groups were in a position where Julian Assange had just announced WikiLeaks' upcoming release of Clinton's emails, Clinton was still under FBI investigation, Trump was attacking Clinton for her use of a private server with his supporters frequently chanting "lock her up!" at rallies). The campaign and the DNC were in a desperate position and really needed a deflection (something that leaks have since shown the DNC had started building a month or two prior to the hacking claims in relation to Russia) and one where they would be fortunate to have a seemingly clumsy hacker that leaves lots of 'fingerprints' tainting files and bringing the reputation of leaks into question. - Sure enough, 2-3 days later, Guccifer2.0, the world's weirdest hacker was spawned and started telling lies in an effort to attribute himself to the malware discoveries and to Wikileaks. Of course, attribution to the HRC camp or DNC leadership is somewhat contradicted by the fact that what we've seen from Guccifer 2.0 suggests an operation carried out by someone with considerable cyber-security and counter-intelligence skills (the misdirection and deception fooled a lot of the cyber-security industry and, apparently, had multiple intelligence agencies convinced) and while their breach claims were discredited, they still had access to the files. 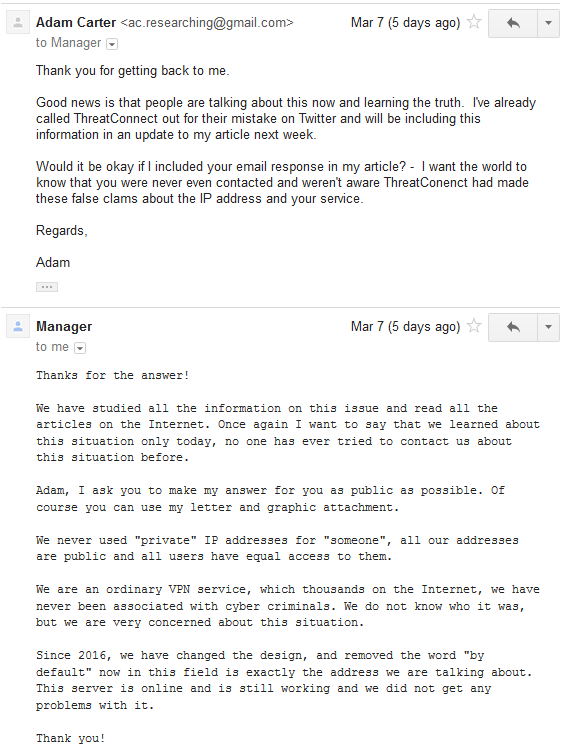 With CrowdStrike deciding to start their NGP-VAN investigation within a week of Podesta's emails being acquired (and 3 months after the actual incident they were apparently investigating) and CrowdStrike making the claims they made in an article released on 14 June 2016 then being supported by Guccifer 2.0 fabricating evidence to support two of their claims the day after publication... AND doing so using Podesta's emails (among other things such as Guccifer 2.0's uncanny recall of Uretsky's breach)... many questions remain about the relationships between these entities, questions that I doubt will ever be answered and questions that I doubt will ever be formally pursued. I've removed the concluding statement about my suspicions as I think my questioning of relationships between entities above is enough. This isn't to say that my position has changed, I just feel that, with all the evidence available, my theory on attribution to specific individuals is unnecessary and gives critics ammunition to call me a conspiracy theorist when the primary purpose of this project is to debunk a conspiracy theory (part of pattern of debunking conspiracy theories on all sides). As part of a considerable body of evidence, we have 6 unique forms of indication pointing to Guccifer 2.0's activities being in US timezones and can show he was deliberately constructing files to have Russian metadata in them... we really don't need to go further... it's up to those who have legitimate access to intelligence and the United States Intelligence Community itself to pursue this further, that is, assuming any have the will to do so. If you have any tips, know of anything significant that's missing from the timeline at all or want to chat about anything related to Guccifer 2.0 feel free to contact me by email (link at top of article) - Challenges to conclusions are welcomed and won't be greeted with hostility. Did Russia Really Hack The DNC?